This report provides critical information on the legal basis for war crimes prosecutions and follows a hearing on religious minorities in the European Parliament. 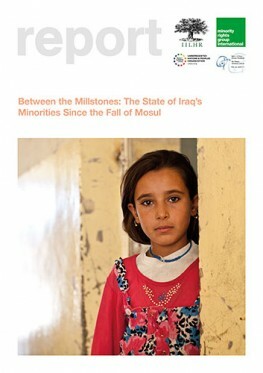 ‘Between the Millstones: Iraq’s Minorities Since the Fall of Mosul’ is a joint report of Institute of International Law and Human Rights (IILHR), Minority Rights Group International (MRG), No Peace Without Justice (NPWJ) and the Unrepresented Nations and Peoples Organization (UNPO) focusing on the Christians, Kaka’i, Shabak, Turkmen and Yezidi – who have been most affected by the conflict. The report combines eye-witness accounts by members of minorities with legal analysis.